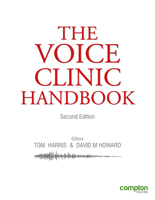 After a period of some 15 years, the new edition of The Voice Clinic Handbook is due for release in early April 2018. You can pre-order your copy at only £95, a saving of £40 on the final published price. But hurry! This offer ends soon. For more information, click on the jacket above.